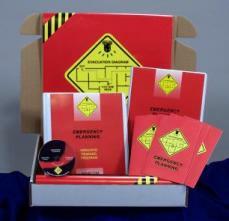 MARCOM's "Emergency Planning" Regulatory Compliance Kit™ assists facilities in complying with various federal and state regulations and helps them prepare for potential emergency situations. Existing OSHA, SARA Title III, and numerous state regulations call for all facilities to meet a number of emergency preparedness/crisis management requirements. These include that every facility have an "emergency plan" that spells out what is to be done in case of an emergency, and that this plan, as well as other important information, be shared with the local emergency planning committee and emergency response groups such as the police, fire department and others. Materials in the kit include a video program, a compliance manual, five motivational posters, and 30 employee booklets. A compliance manual containing a "fill-in-the-blank" emergency plan, as well as other materials needed to help meet compliance requirements, is included. The posters in the kit emphasize the importance of preparing for an emergency. The video program and employee booklets include information on types of emergencies, the emergency plan, the "crisis management team", evacuation, communications, the role of outside agencies, practice sessions and drills, and more. The video program in the kit comes with a comprehensive leader's guide, reproducible scheduling & attendance form, employee quiz, training certificate and training log.